Make sushi the easy way by layering ingredients in a pan...no special rolling technique or mess!! You can even bypass making the sushi rice by using an instant powdered sushi seasoning mix...how easy is that?? 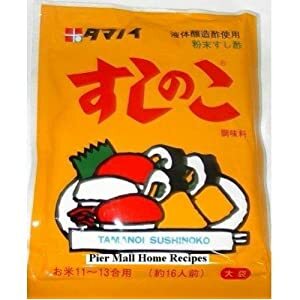 Order Instant Sushi Mix - Making sushi at home was never easier with Instant Sushi Mix! Press out oil or water from canned tuna. Heat 1 tsp. oil in skillet. Add tuna and flake it with fork. Add above ingredients & cook for 5 minutes. Put the rice in a large bowl and wash it with cold water. Repeat washing until the water becomes almost clear. Drain the rice in a colander and set aside for 30 minutes. Place the rice in rice cooker and add water. Let the rice soak in the water at least 30 minutes. Start the cooker. When rice is cooked, let it steam for about 15 minutes. Prepare sushi vinegar (sushi-zu) by mixing rice vinegar, sugar, and salt in a sauce pan. Put the pan on low heat and heat until the sugar dissolves. Cool the vinegar mixture. Spread the hot steamed rice into a large plate or a large bowl. Use a non-metallic bowl to prevent any interaction with rice vinegar. It's best to use a wooden bowl called sushi-oke. Sprinkle the vinegar mixture over the rice and fold the rice by shamoji (rice spatula) quickly. Be careful not to smash the rice. To cool and remove the moisture of the rice well, use a fan as you mix sushi rice. This will give sushi rice a shiny look. It's best to use sushi rice right away. This is the easy part. To assemble the sushi, get a 9x13 pan and layer with waxed paper or clear wrap to make removal easy. Press half of the rice on bottom of pan. Be sure to press down firmly to ensure that rice does not fall apart when cut. You can use a piece of clear wrap to press down with your hands or using a flat object. Once that is done, layer the seasoned tuna evenly across the first layer. Sprinkle furikake and additional seasoned seaweed if you want. Pour the remaining rice over the tuna layer repeating the flattening of the rice evenly over the entire pan..this is the top and final layer. Now you can garnish the sushi with furikake and seasoned seaweed, sesame seeds etc.